the'-bez (tebhets, "brightness"; Codex Vaticanus Thebes; Codex Alexandrinus Thaibais): A city in Mt. Ephraim which refused submission to Abimelech when he set up as king of Israel. 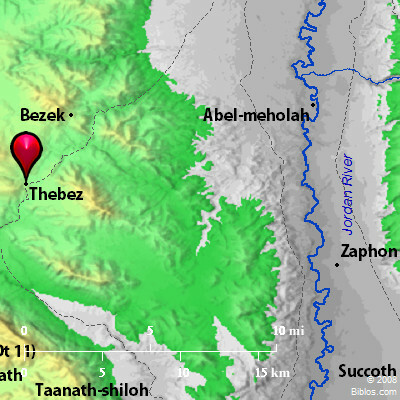 After the reduction of Shechem he turned his arms against Thebez. There was a strong tower within the city-the citadel-into which all the inhabitants gathered for safety, climbing onto the roof of the tower. Abimelech incautiously venturing near the tower, a woman cast an upper millstone upon his head and broke his skull. Fearing the shame of perishing by the hand of a woman, he persuaded his armor-bearer to thrust him through (Judges 9:50). The incident is alluded to in 2 Samuel 11:21. Eusebius, Onomasticon places it 13 Roman miles from Neapolis (Nablus) on the road to Scythopolis (Beisan). There is no doubt that it is represented by Tubas. This is a village situated in a district of considerable fertility, about 10 miles from Nablus. There are many olive trees. The rain is captured and led to rockcut cisterns, whence the village draws its water-supply. According to the Samaritans the tomb of Neby Toba marks the grave of the patriarch Asher. THE'BEZ, now Tubas, 9 ms. n.e. of Shechem, a handsome village, without a spring, and on the e. slope of a hill, 1227 ft. above the Mediterranean.